Bring some old school back into your young man's life. Once upon a time, every kid had one of these and spent hours plucking away at tin cans or other targets of opportunity. Didn't Tom Sawyer and Huck Finn have one? 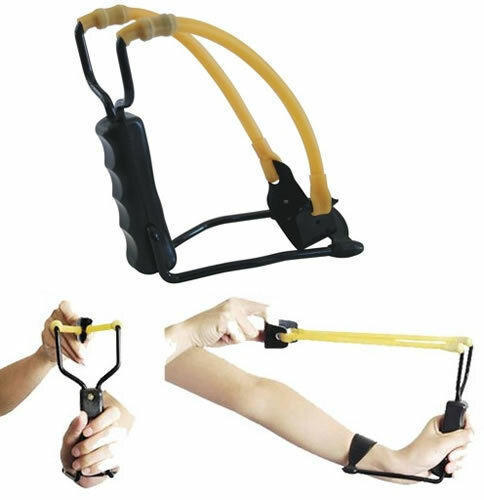 Wrist braced slingshot folds down to a compact size and can launch your ammo out to a 100 yards. Of course, for practical target shooting purposes, you won't be trying to hit anything that far out but the energy released with this is powerful. This pocket sized sling shot is a high impact weapon. It has a lightweight aluminum frame and split leather pouch. 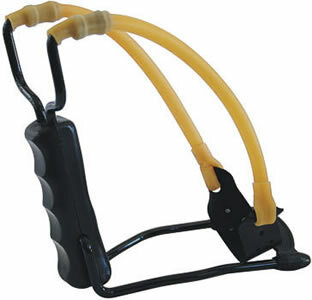 This slingshot is perfect for vermin control or for just having fun. Bring some old school back into your young man's life. Once upon a time, every kid had one of these and spent hours plucking away at tin cans or other targets of opportunity. Didn't Tom Sawyer and Huck Finn have one? Instead of playing inside on a video game, they can learn a real world skill that helps with hand and eye coordination. Even as an adult, you'll find one of these tremendously fun. You can make a contest with your family or friends to see who is most accurate at hitting a stationary target. Set up a few beer cans at the next barbecue and have at it. Order yours now so you'll have it at your next outing! These are a good addition to your survival kit. Besides it's obvious hunting attribute, they can also provide a recreational activity that can keep you from getting bored awaiting rescue during downtime. Explosive Power with the Accuracy to Back it Up! Slingshots are loads of fun. In no time at all, you be able to hit your target every time. Paintballs and extra bands with ammo are also available. Steel shot is the best ammo for this. Ball bearings or even those steelies you used to play with as kids when shooting marbles are good. Slingshots are some of the most underrated ranged weapons on the planet, but they can be just as effective as any other ranged self-defense weapon. In fact, they can be as devastating as some guns or longbows. Unlike these more popular weapons, however, when you use slingshots for self defense, nearly any projectile can be used as ammunition. It just has to fit into the pocket or pouch of the sling and through the prongs of the handle. Whether you are prepping for the collapse of the world or you just want a way to hunt for game without having to carry firearms or cumbersome bows, this ranged weapon is for you. It is perfect for hunting small game, scaring off larger game, and dissuading persistent criminals. With enough draw and the right ammunition, one of these could be used to make birds fall to the ground, kill small game like rabbits or squirrels instantly, and even stun violent and rabid wolves. If you have learned how to aim properly, you could disarm a criminal or impair their ability to walk and move by shooting a knee. Using steel shot or glass marbles as ammunition, you can go through thick plywood, and even damage bedrock slightly. Using the rubber’s maximum draw strength, heavy metal balls could penetrate skin and flesh or crack bone. In the hands of someone who knows how to use it, this is definitely no mere child’s toy. This is why it is recommended that you use utmost caution, especially when you are able to hurl projectiles while drawing the rubber bands all the way back for maximum power. This ranged weapon is a hunter’s tool. If you choose to wield it, then it is your responsibility to be a safe and cautious hunter. For this particular model, aluminum and plastic make up the frame. The light aluminum frame itself allows it to be as tough as it is powerful. The high-quality plastic handle is molded with finger grips that make it easy to hold and keep steady. The included wrist guard supports your wrist every time you stretch the rubber bands for a shot. It allows you to pull further without having to rely solely on your wrist to keep the slinger in place as you are aiming. Do not worry; the weapon does not have to retain this inconvenient shape all the time. The handle and the wrist guard fold atop one another, allowing the slingshot to be carried in a convenient little package, whether in your pocket or in a separate bag. Attached to the two prongs of the handle are the rubber bands that can be stretched to several feet, building momentum with each stretched inch. At the end of these bands is the split leather pouch that can accommodate small metal balls, glass balls, pebbles, and with some modifications to the weapon, even arrows. Yes, there are ones that even shoot arrows. If you use standard ammunition, the weapon’s range is an impressive 100 yards. You do not have to use recommended ammo necessarily. Basically anything can be used as ammunition, as long as it is light and small enough for the rubber bands to hurl without hitting the prongs, but also heavy and aerodynamic enough to fly through the air. Seriously, anything that fits this description can be shot out and used as ammunition. There is even an expert on Youtube who managed to shoot playing cards with an ordinary sling shot. It is difficult to do, but if you want to attempt it, every step of the process is explained on the video. The first part of learning slingshot aiming techniques is holding the weapon firmly using your dominant hand. For the purposes of basic aiming, hold the weapon upright, with your eyes looking through the prongs so you can see where you are shooting. Do not lock the joints of your dominant arm. It should be stretched out fully but not to the absolute limit of your elbows. Align your hand with your shoulder, and let your elbow bend just a tiny bit. This is going to give you better aim and control. Remember this position for your dominant arm. Using your other hand, load a piece of ammo into the leather pouch. Pinch the ammo inside the split leather pouch using your thumb and forefinger. Make sure to have a firm hold on the loaded pouch. Put your dominant hand into position and grip the weapon firmly. Pinch tightly and pull back with your other hand, stretching the rubber bands. Aim it, and release. In order to familiarize yourself with the proper use of the weapon, you can pull the rubber back just one or two feet at first. When comfortable enough, you can pull it farther back nearer to your face before releasing, allowing the bands to build up more power and momentum. If shooting at targets from a full 100 yards, you can aim down the middle of the prongs for accuracy. However, if your targets are closer, you can use a method called intuitive aiming. Intuitive aiming is aiming accurately just by estimating the trajectory of your projectiles without using the prongs as a targeting scope. If your targets are only several feet away, and you are already used to shooting with the slingshot, you can aim intuitively and still shoot accurately. When aiming intuitively, you do not even need to hold your weapon upright, as you will not need to see down the prongs. You can hold it sideways and aim from the hip, or whichever way or angle is easier or faster for you. This allows you to reload, pull the bands back all the way, and fire much faster when your targets are getting close. This can be useful for when you are being attacked by wolves in the wild, or if you want to practice rapid-firing your weapon accurately on non-moving targets. As you can imagine, it is also a great way to use pain compliance against street criminals. To use the sling shot, grip the vertical part of the ‘Y’-shaped catapult firmly with one hand (usually the less dominant hand). Arm the shot by placing a projectile on the leather pouch. It has to be on the center of the pouch to prevent it from falling or losing momentum at mid-flight. Keep the projectile in place by enclosing it with the fingers of the other hand. Next, raise the hand holding the catapult in front of you, slightly diagonal to your body. Your line of vision if you were looking straight forward and your raised arm should form a 45-degree angle. This will optimize your ability to aim, stretch the bands of the sling shot and release it comfortably. Holding the projectile within the pouch, stretch the bands toward your chin or cheek, depending on how you’re aiming. Use the upper ‘V’ shape of the catapult as a sight to keep your target in view. The target must be at the center of the ‘V’ shape. The bands should form a straight, horizontal line parallel to the ground. Next, release the projectile by letting go of the pouch. Your hand should move backward, allowing the bands to freely stretch back to their original shape so they can push the projectile. Do not attempt to ‘guide’ the projectile by bringing your hand forward prior to the release. This will weaken the stretch and reduce the momentum. Initially, you might not be able to hit the target accurately. To use the sling shot effectively, you will need a few tries. Get to know your sling shot — familiarize yourself with how it ‘behaves’ and compare the distance your projectiles travel as you stretch the bands to different lengths. Most of the time, the longer you stretch the bands, the farther the projectile travels. In time, you will be able to gauge the appropriate force required to hit a target from a certain distance. Be a responsible owner of a hunting sling shot. The force of a projectile can break glass, puncture cardboard, paper or thin wood panels and could hurt a person or an animal. It can even be dangerous, causing unnecessary physical harm. When using for target practice, make sure you are shooting at an inanimate object propped up against a wall or an area where no human or animal passing by will be hurt and cause you legal problems in the future. If you must use it for hunting, make sure you are aware of its power, efficacy and any legal restrictions you might have to conform with. Had one as a kid. Way too fun!